There are few lifelong Chicago White Sox fans as devoted as Tara Nagy ’18 — except maybe her father, who raised his daughter to root ardently for their home-state team from the time she could first hold a hotdog and do the wave. So when Nagy was offered a position as a business intelligence analyst with the White Sox this past June, she knew Dad would be proud. “When he found out about this job, he was over the moon,” she said with a laugh. Nagy is crunching data to help the organization make wise business decisions in a variety of areas. As a business intelligence and analytics and finance double major, the skills she learned at Saint Mary’s are being put to use on a daily basis. 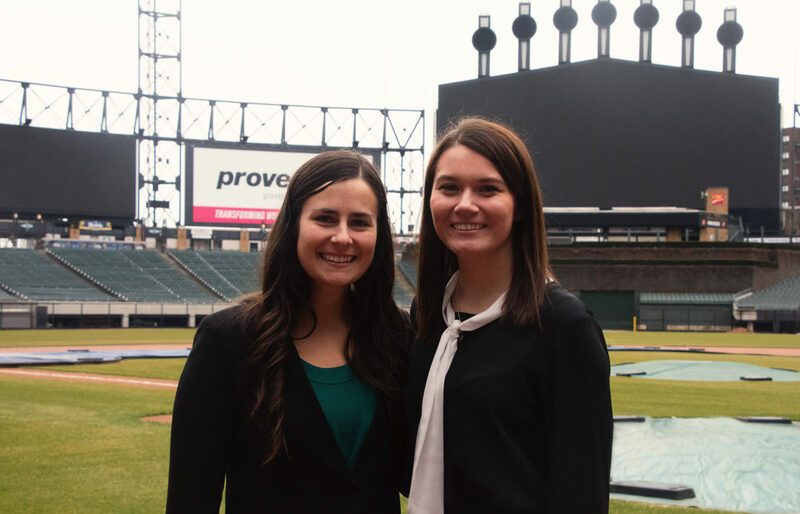 And, she — and another Saint Mary’s alumnus, Julianne Bartosz ’13, manager of public relations at Chicago White Sox — are always hoping to encourage more women to work on the business side of sports. Before applying for the White Sox position, Nagy connected with Bartosz — who had previously spoken to her and other Saint Mary’s PR/Business Club members — for advice. Bartosz, who majored in Spanish and public relations at Saint Mary’s, began working for the White Sox in January 2014. When she was contacted by Nagy, she was excited that a fellow Cardinal student-athlete had reached out to her about applying. While Bartosz played softball and hockey at Saint Mary’s, Nagy played volleyball. “It was a great opportunity to let Tara know what the culture is like here,” she said. “She was able to get a better sense if she would be interested in the role and then, ultimately, I was able to recommend her for the role. The hiring manager reached out and thanked me for sharing her résumé and then talked to me about her fit for the role — beyond the résumé. Now the two connect within the organization regularly, most recently collaborating at SoxFest, which is one of Bartosz’s biggest projects. In her public relations role, Bartosz focuses on the team’s off-the-field communications, which involves writing content and press releases and coordinating media for new sponsors, entertainment events, guests at the ballpark, charitable efforts, and community appearances. She also plans various events like the fan convention SoxFest, which recently brought in a sold-out crowd of more than 8,000 fans over a three-day period. Another new aspect of her job is the White Sox’s inclusion initiative, “BasebALL: One Game for All,” which involves planning various activities and speakers to promote diversity and inclusiveness among fans. While Bartosz has a leadership role in public relations, Nagy’s work touches many different departments within the organization, including sales, security, advertising, and marketing — the many areas who use data analysis to increase revenue and revamp business or event decisions. One of her biggest projects to date has been analyzing how the number of promotional giveaways could be tied to attendance numbers. “Data is big in the sports industry,” she said. Both women love that their jobs are different day-to-day and are constantly challenging them, and both credit Saint Mary’s for preparing them for their careers. “I wouldn’t be where I am today without Saint Mary’s,” Bartosz said. Both alumnae also credit Saint Mary’s for providing them with strong communication skills, which are highly sought after in today’s competitive job market. As part of the Game Changers events, Bartosz is hosting events which encourage women to break out of their comfort zones. She said the White Sox are often front-runners for setting trends in the industry, and fittingly they hired one of the first female scouts.